We have all heard the saying “beauty is only skin deep,” which is true, but, lets be honest, who doesn’t want great skin?? Lush is a great company that makes fresh handmade cosmetics, and they use little to no preservatives in their products. I wanted to share with you all some of my favourite (yes, I added a “u” since they are from the UK) products from them, because I have really been enjoying some items recently! First, the Rub, Rub, Rub shower scrub is a wonderful sea salt-based scrub that you can use all over your body in the shower. It has a dash of lemon juice and the tropical scent of mimosa blossoms, which gives it a slight floral scent. This scrub really leaves your skin feeling soft, and you do not need much. Apparently, you can also use it as a shampoo! Mint Julips is a great lip scrub that tastes really good! It contains fresh peppermint, which leaves your lips feeling nice and tingly, and castor sugar to exfoliate and nourish. The lip scrub is completely edible and it tastes and smells like mint chocolate chip ice cream. They say you can lick off the excess once you scrub it all over your lips, but I prefer to wash it off even though it does taste really good. The thing is– why would you want to lick off the dead skin on your lips?! Third, Aqua Mirabilis is a really great exfoliating body butter. You use this in the shower and rub it all over your dry spots to get rid of all of your dry skin, and it works really great! It contains cocoa butter, almond butter, ground almond shells– which exfoliates– sandalwood oil, and rose absolute. It definitely gets rid of pesky bumps on your skin and the butters leave your skin feeling moisturized and smooth. Fourth, my favourite shower gel ever ever! Snow Fairy. It is a really sweet smelling shower gel so if you do not like the smell of bubblegum and sweet vanilla then you won’t like this. I generally do not really like sweet candy smells, but this is just really addicting! It comes out once a year during the holiday season so this year I snatched up the large bottle because the medium sized one just wasn’t enough for me! Although this shower gel contains a lot of chemicals and not really any natural ingredients, I don’t care! It’s that addicting. Lush’s Tea Tree Water Toner is an amazing toner that really gets all of the gunk out of your pores. It is for oily, combination or blemish prone skin, and it works wonders. This toner has tea tree water, grapefruit water, and juniperberry water, which makes it really clarifying and fresh. Tea tree water is antibacterial so it really helps those with blemish prone skin. I love using this after using my Clarisonic on the days I wear a full face of heavy makeup because it really cleans out the pores and leaves your skin feeling so clean. Lastly, Grease Lightening is a spot-cleansing gel that is also great for blemish prone skin. This is a tea tree gel that you apply to your troubled spots and it really soothes those pesky, painful blemishes. It contains a mixture of thyme, tea tree, and rosemary, which cleans up dirt and fights off bacteria. As well as aloe vera gel that soothes the skin and calms any irritation. I apply this at night on any painful trouble spots, and it is instantly calming, but overnight I have noticed it also helps reduce the size of my blemish! 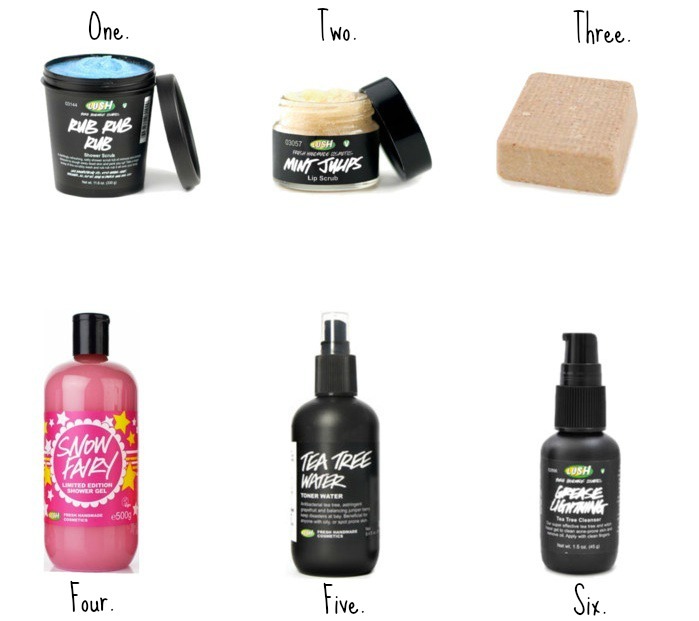 These are just a handful of products that I love from Lush, which is a company that I am really starting to love. My skin is really pesky at times and I love using fresh handmade products that have great, fresh ingredients–for the most part! Have you tried any of these products? If you have tried Lush, what are your favourite products? I want to try out more products from them and would love some recommendations!